While the start an evolution campaign has concluded, its legacy of uniting UBC’s global community of 300,000 alumni will continue to contribute to the university’s success well into the future. That vital relationship is symbolized by the recently opened Robert H. Lee Alumni Centre. 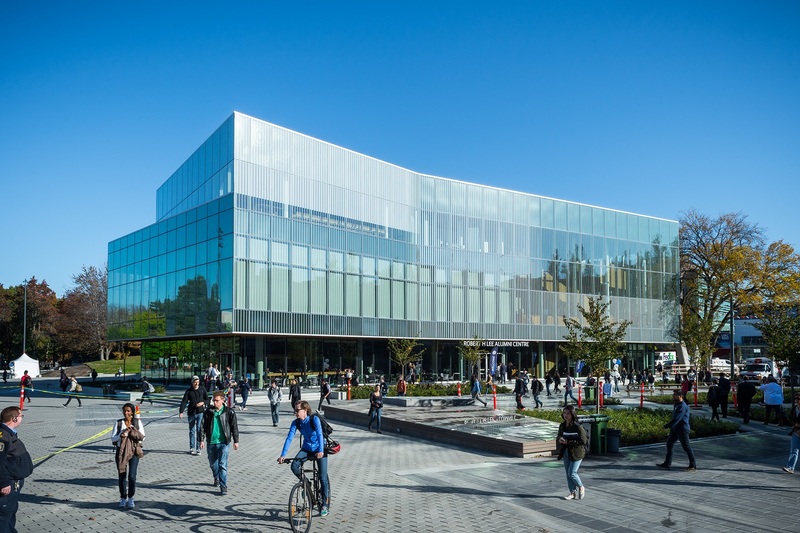 The first of its kind in Canada, the centre is an eye-catching four-level structure forming part of the new Money and Raymond MC Lee Square, a revitalized area at the heart of UBC’s Vancouver campus. It is a place for connection, collaboration and life‑long learning, as well as a showcase for the exceptional accomplishments and aspirations of UBC alumni. It’s also the place where the university welcomes alumni and the broader community – in effect, UBC’s front door. The building is named for Dr. Robert H. Lee, CM, OBC, BCom’56, LLD’96, a former university chancellor and governor, founder of UBC Properties Trust and honorary campaign chair for start an evolution. As someone who has been lending his support and business expertise to the university for the past three decades, Dr. Lee was the natural choice for this honour. Despite a full schedule, he finds as much time as possible to accommodate frequent meeting requests from admiring commerce students, demonstrating his belief in the kind of interaction that will be a cornerstone of activity at the alumni centre. Located next to the AMS Nest (the new student centre), the alumni centre is ideally placed for fostering all the natural connections between students and alumni – especially in the areas of mentorship, employment, and innovative learning opportunities. Other partnerships include the university’s entrepreneurism program — e@UBC — which is now operating out of the Graham Lee Innovation Centre in the building, and UBC Continuing Studies. Visitors will also discover a café, historical displays, interactive screens, stunning artwork, and a variety of beautiful spaces available for rent. The idea for an alumni centre first surfaced in 1999, and many alumni volunteers have been involved in driving the project. When UBC’s start an evolution campaign was launched in 2011, the centre was identified as one of its top five priorities. Since then, more than 1,000 alumni and friends of UBC have contributed to make the dream of a UBC alumni centre a reality. A tribute wall in the Wong Trainor Welcome Centre, the facility’s main reception area, is a permanent acknowledgement of their generosity. Donations are still welcomed to the centre, and contributors can choose to share their stories and memories of UBC on the Point of Light website. Many alumni fell in love while at UBC, discovered their professional passions or carried a family tradition, and these stories are commemorated on the website. Executive Director of alumni UBC Jeff Todd says the centre is much more than a building, noting it offers the resources to support an ongoing and mutually beneficial relationship between UBC and our alumni.